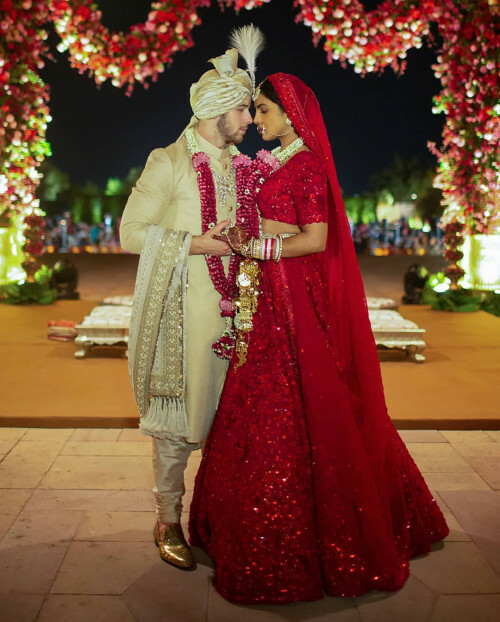 Everyone’s talking about just one wedding right now, Nick Jonas and Priyanka Chopra’s. 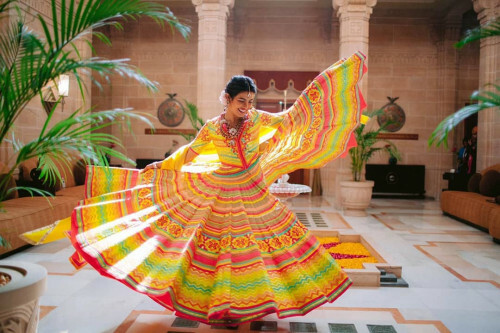 The couple look absolutely amazing together and their wedding was no exception – beautiful clothes, celeb guests and a palace as the venue. While everyone will be writing about the wedding and focusing on all the details related to the couple, i thought i would write about the venue. A few of my favourite pics from the wedding first though. The couple have been very tight lipped about the wedding and there have been very few official pictures released. But the ones that have been released look absolutely gorgeous, with the couple looking so in love! 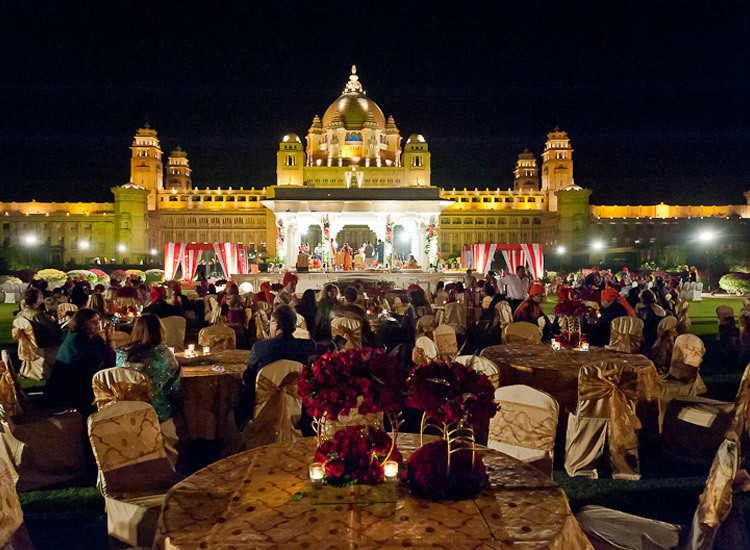 Umaid Bhawan Palace, located in Jodhpur in Rajasthan, India, is one of the world’s largest private residences. 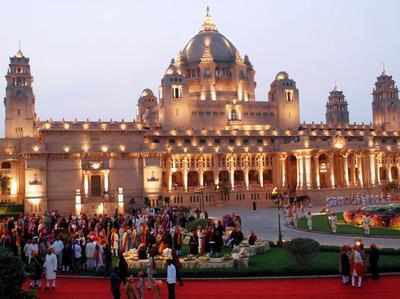 A part of the palace is managed by Taj Hotels. Named after Maharaja Umaid Singh, grandfather of the present owner Gaj Singh. 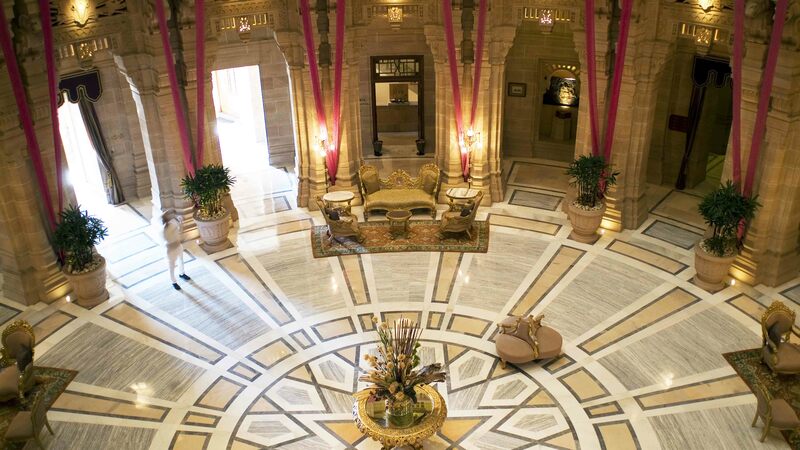 The palace has 347 rooms and is the principal residence of the former Jodhpur royal family. A part of the palace is a museum. Ground for the foundations of the building was broken on 18 November 1929 by Maharaja Umaid Singh and the construction work was completed in 1943. The Palace was built to provide employment to thousands of people during the time of famine. History of building the Umaid Bhawan Palace is linked to a curse by a saint who had said that a period of drought will follow the good rule of the Rathore Dynasty. Thus, after the end of about 50-year reign of Pratap Singh, Jodhpur faced a severe drought and famine conditions in the 1920s for a period of three consecutive years. The farmers of the area faced with famine conditions sought the help of the then king Umaid Singh, who was the 37th Rathore ruler of Marwar at Jodhpur, to provide them with some employment so that they could survive the famine conditions. The king, in order to help the farmers, decided to build a lavish palace. The foundation stone was laid in 1929. About 2,000 to 3,000 people were employed in its construction. 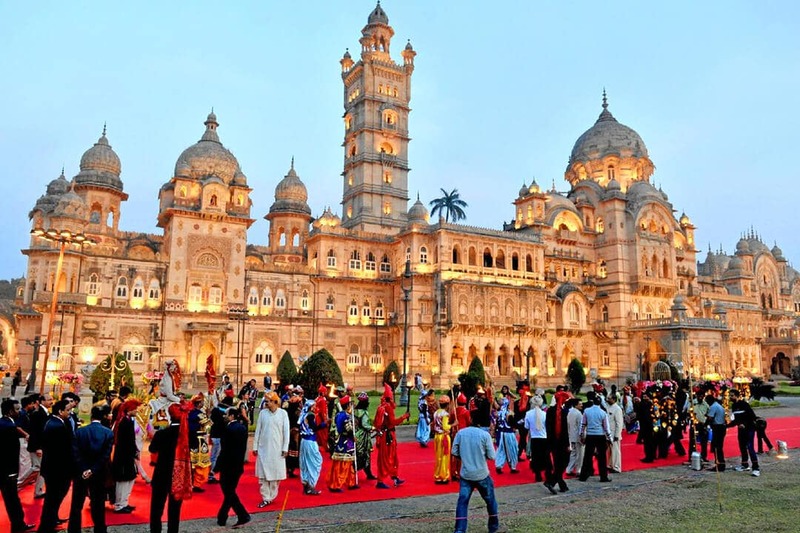 Occupation of the palace by the Maharaja came after its completion in 1943, and close to the period of Indian Independence. The estimated cost of building the palace was Rs 11 million. When it opened in 1943 it was considered as one of the largest royal residences in the world. The palace was built with “dun-coloured” (golden – yellow) sandstone with two wings. Makrana marble has also been used, and Burmese teak wood has been used for the interior wood work. 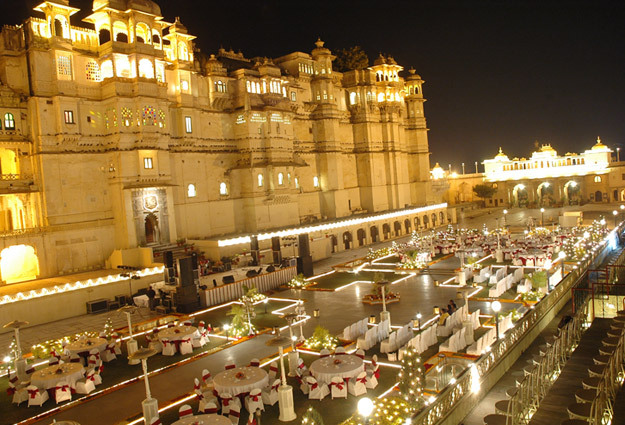 When completed the palace had 347 rooms, several courtyards, and a large banquet hall which could accommodate 300 people. 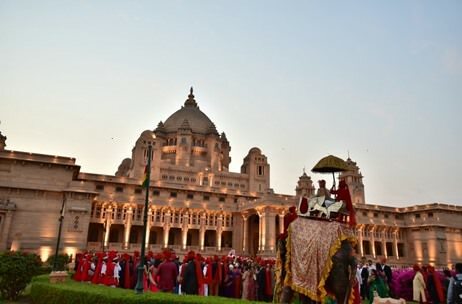 The Palace is divided into three functional parts – the residence of the royal family, a luxury Taj Palace Hotel, and a Museum focusing on the 20th-century history of the Jodhpur Royal Family. Imagine having your wedding in the same place as where the royal family lives. Windsor castle is not available for wedding receptions now is it? 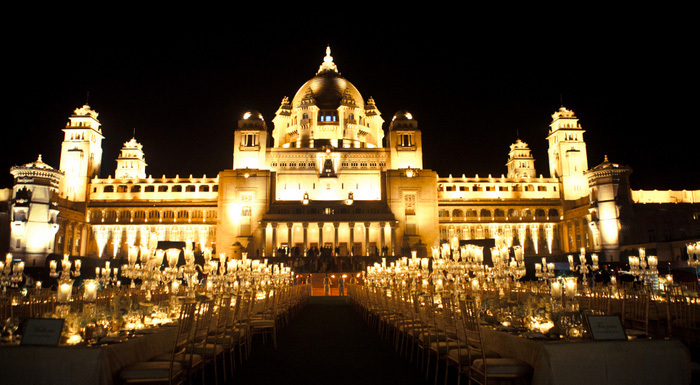 So if you’re looking for lavish and royal, head to India and do it in proper royal style! 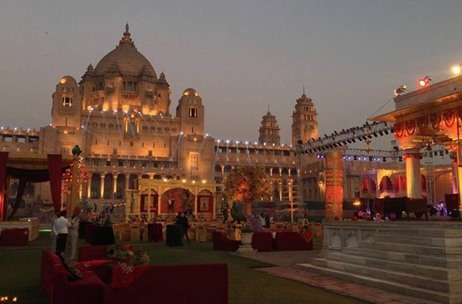 To give you a sense of the scale of weddings at Umaid Bhawan palace, I collected some pictures of previous weddings at the palace. The decor ranges from average to blow your socks off, so I am putting this down to individual tastes and preferences of the couples getting married. I personally dont like the colourful lighting used and that usually is an instantly put off for me. 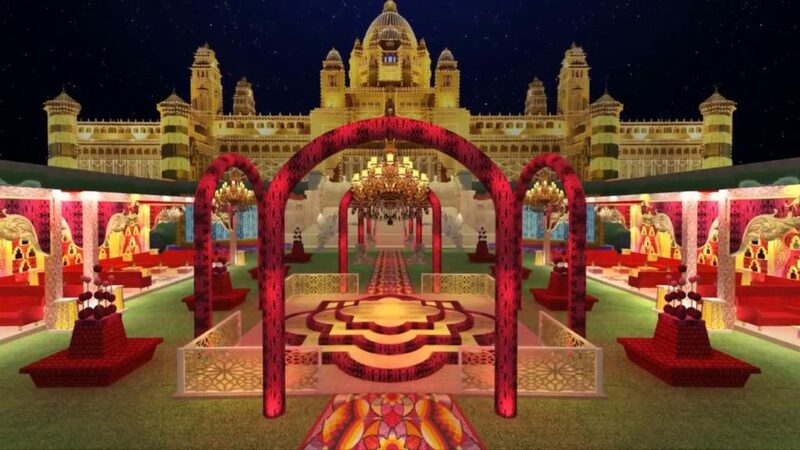 So my lovelies, if any of you decide to get married at this palace or any other for that matter, please do share photos. I’d love to see what it looked like and I will pretend that I was part of it as a guest!